This is what it looks like in near space. Some people have mistaken pictures like this for one taken by astronauts on the International Space Station. I have to confess that I’m a science geek. And since 1996, I’ve been expressing my science geekiness with a high altitude balloon program that I refer to as a poorman’s space program. Essentially, it means I launch weather balloons with radio tracking equipment and automated experiments to explore the heavens, atmosphere, and ground. A weather balloon can climb higher than 100,000 feet and at those kinds of altitudes, it looks and feels a lot like outer space. And the cost of one of these flights is down right cheap compared to a rocket launch into Earth orbit, hence its poorman’s space program moniker. So imagine for a moment a place that’s between 10 and 20 miles overhead. Were the air pressure drops to 99% vacuum, the horizon becomes noticeably curved, and the overhead sky turns pitch black. This is what it’s like within the mid-stratosphere, or near space. With an unmanned weather balloon, experiments reach near space in less than an hour and have at least another half hour to explore it. A weather balloon can carry many kinds of a science experiment, just as long as that experiment can operate without human intervention. I didn’t start flying near space experiments with the solar eclipse in mind. However, once I realized that I could fly a mission during the solar eclipse, I did everything in my power to make sure I’d be ready. Actually preparing for the mission was simple, it was picking the launch site that was difficult. 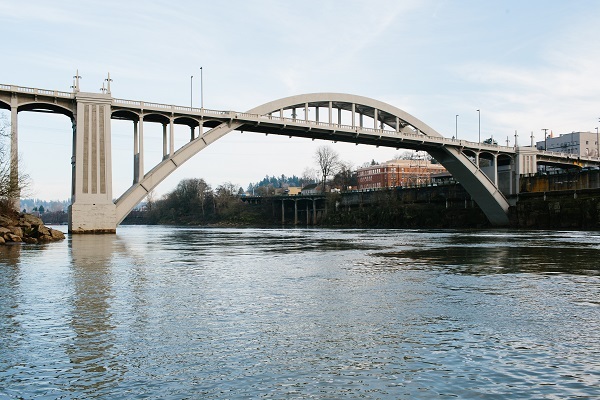 It was difficult because of one of Idaho’s blessings and curses – it’s so mountainous. 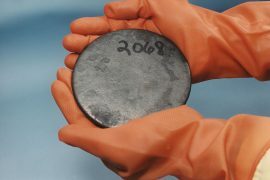 Idaho’s extensive range of mountains makes it difficult to find a launch site that’s both convenient to reach and that results in a recovery site where the chase crew can retrieve the experiments. So this is why my wife and I ended up launching the eclipse weather balloon just over the border in Ontario. I want to thank Frazier Aviation for giving my wife and me a safe location at the Ontario airport to launch the balloon. We were able contact both the FAA and local civilian pilots prior to the launch to ensure the balloon stayed out of everyone’s way. It turned there was a second benefit of launching at the Ontario airport; over a dozen private pilots had flown in to see the eclipse. And this audience was very happy to help with the balloon launch. Their efforts ensured that the mission was a success. Weather balloons are big. This one was seven feet tall once filled with enough gas to lift its 12 pound science payload. Over half a dozen volunteers, visiting the airport to watch the eclipse, helped get this flight underway. The short flight path predicted for this mission (only 32 miles) meant we had plenty of time to observe the eclipse and some of its effects before we had to start chasing the balloon. Below is an example of the eclipse pictures I recorded at the Ontario airport. 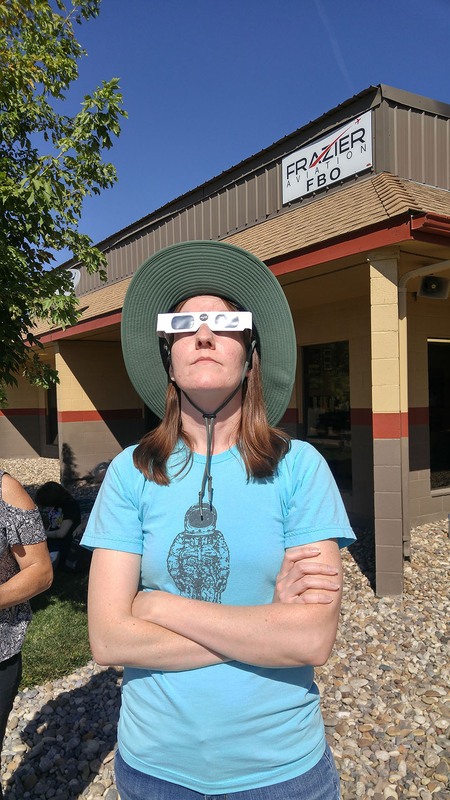 My wife safely watching the eclipse with her eclipse glasses. I managed to snap a few pictures of the eclipsed sun using a Fuji FinePix S700. The lens was set to six power optical zoom. The end of totality. 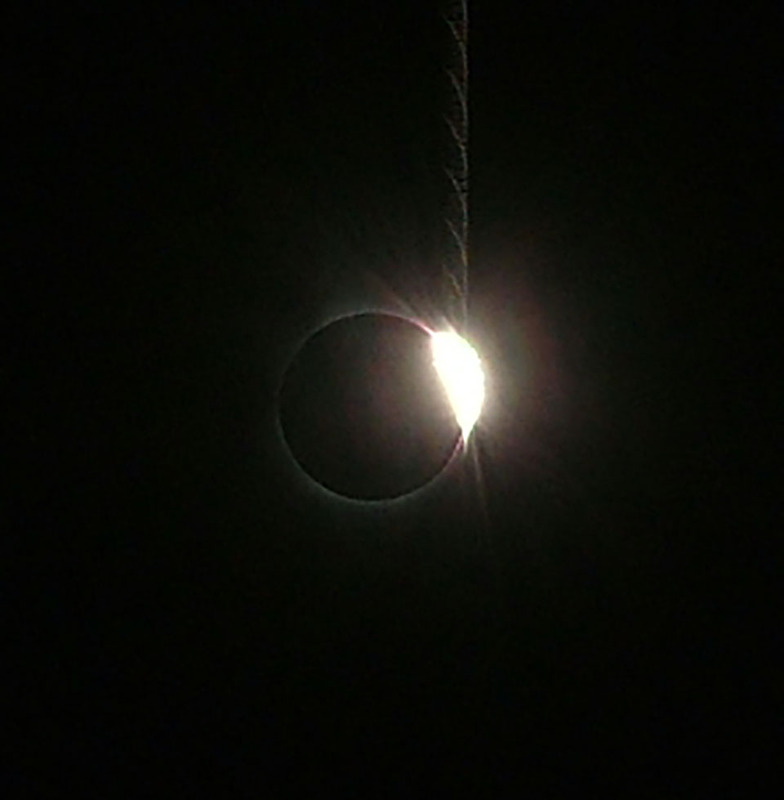 However, before more than a sliver of the sun had a chance to pop into view, I snapped a picture of what is called the Diamond Ring. The drive south of Ontario and past Vale went well and we were able to track the balloon over both the internet and amateur radio. The problem began only once the balloon was close to landing. 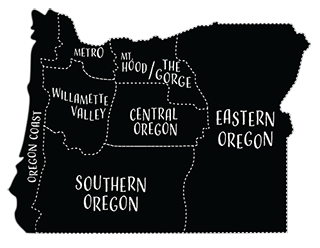 We were now driving west of Homedale, ID and south of Owyhee, OR where there’s very little if any cell phone service. Making matters worse, the mountains made receiving transmissions from the balloon’s radio trackers spotty. The balloon traveled very closely to the path predicted for it the day before. Each red dot is a position report and these occurred at 60 second intervals. One thing to notice is how the winds changed speed and direction as different altitudes. The largest change in the balloon’s flight occurred at 60,000 feet when the balloon started heading west very slowly. The KD4STH-7 label is one of the amateur radio callsigns my balloon used. The last position report we received over our ham radio was when the balloon was still 1,000 feet above the ground. Our cell phone had no bars, so we couldn’t check out the position reports coming from other ham radio operators who might have received signals when the balloon was even closer to the ground. Even worse, without cell phone reception, we couldn’t check Google Maps for roads that brought us close to the last known position of the balloon. At this point, I had to take my wife home. She had a class than evening and couldn’t afford to miss it because of a lost balloon. Turns out, it was fortunate that I brought her home, because there we had internet and I found an updated position from the balloon. I was elated that I now had an excellent position on the balloon’s landing location. Even more exciting, the balloon was just 1,000 off a major road. 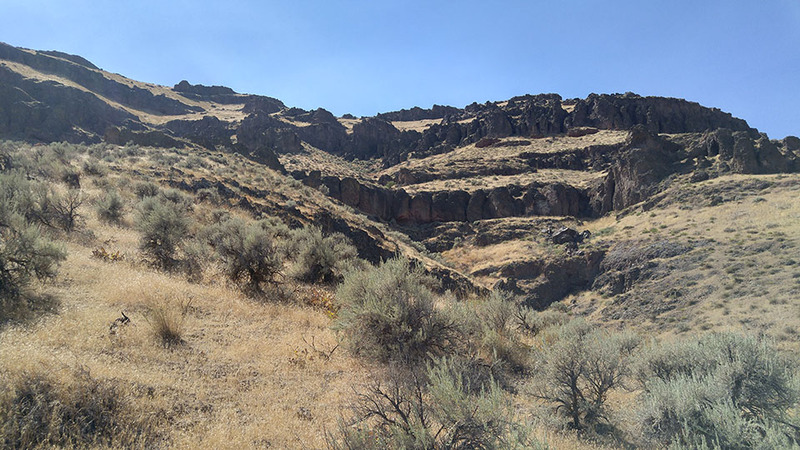 According to Google Maps, I just needed to drive to the town of Owyhee and then drive five miles south on Owyhee Lake Road. So I loaded up a couple of water bottles and snacks before hitting the road. After driving a few miles along Owyhee Lake Road I was able to pick up radio transmissions that confirmed the balloon’s exact location. But there was problem, a mountain had gotten in the way of the balloon’s descent. So I knew where the balloon was, 700 feet above the road on some of the steepest climbing I’ve ever have to do. This is the scene greeting me when I got out of my car. I knew it might be a challenge, but I didn’t realize how much. All I can say is be sure to drink plenty of water on a recovery like this. Wearing gloves would be a good idea also. It took an hour to reach the balloon on foot and then another hour to get back down to the car. Often I would take a step forward and then slide down two. Other times I would stand up after sliding only to fall over again. The mountain’s steepness and loose scree where huge hindrances to the recovery. Since the balloon’s experiments potentially contained some of the most exciting data I’ve collected in near space, I doggedly kept up my recovery efforts (an additional motivation was the fact that the balloon’s payload was worth over $1,000). So just what data did I get from this flight? Well, that’s going to take a little explanation. My best experiment was undoubtedly from a camera designed to record images in near infrared (NIR). Visible light, that is the colors we observe in the rainbow, is scattered to varying degrees by molecules of oxygen and nitrogen in the atmosphere. The blue end of the visible spectrum is scattered the most strongly while the red end is hardly scattered at all. This preference for scatting blue light is why Earth has blue skies and red sunsets. Since NIR light is beyond red light, it’s scattered even less by the atmosphere and therefore penetrates the atmosphere to get very sharp images of the ground. This means the black and white NIR images were able to show the moon’s shadow on the surface as if the atmosphere didn’t exist. An added benefit is that when viewed in NIR, plant chlorophyll appears bright white. That’s why farm fields appear as bright white rectangles and circles in the NIR pictures. Lakes and other bodies of water don’t reflect the sun’s NIR and appear as black as tar. 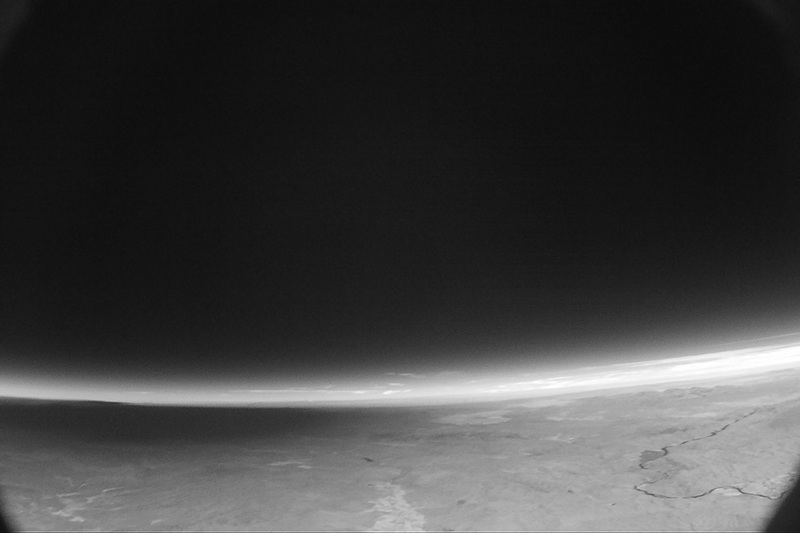 Looking northwest to mid-state Oregon, the camera recorded this image of the moon’s shadow approaching at a speed of 2,000 MPH. The balloon’s altitude at the time of this picture was 43,000 feet, meaning the distance to the horizon is 254 miles, or three times greater than the moon’s diameter of 70 miles. The horizon appears strangely curved in this picture because the camera has a wide-angle lens. 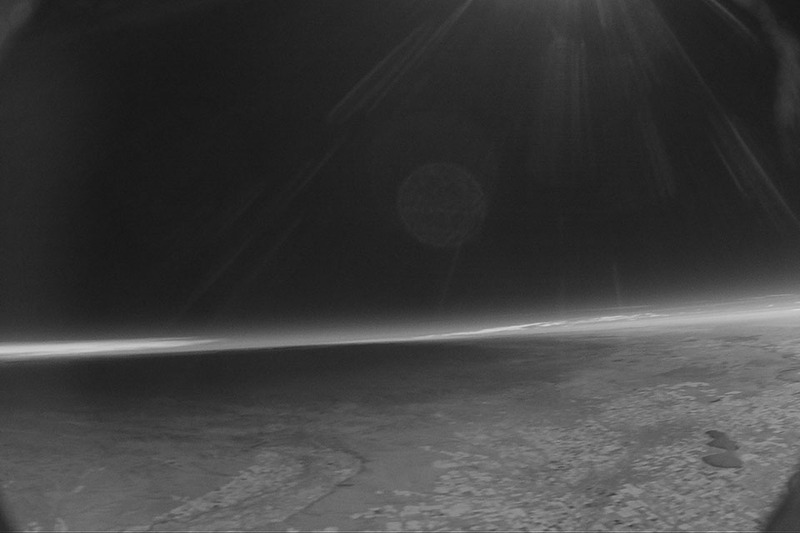 At an altitude of 45,000 feet, the balloon records the moon’ shadow traveling east towards Idaho Falls. The Emmett Valley is visible at the bottom center of the image and Lake Lowell appears as the dark patch at the lower right. Individual farm fields appear as the white blocks around Lake Lowell and Emmett. 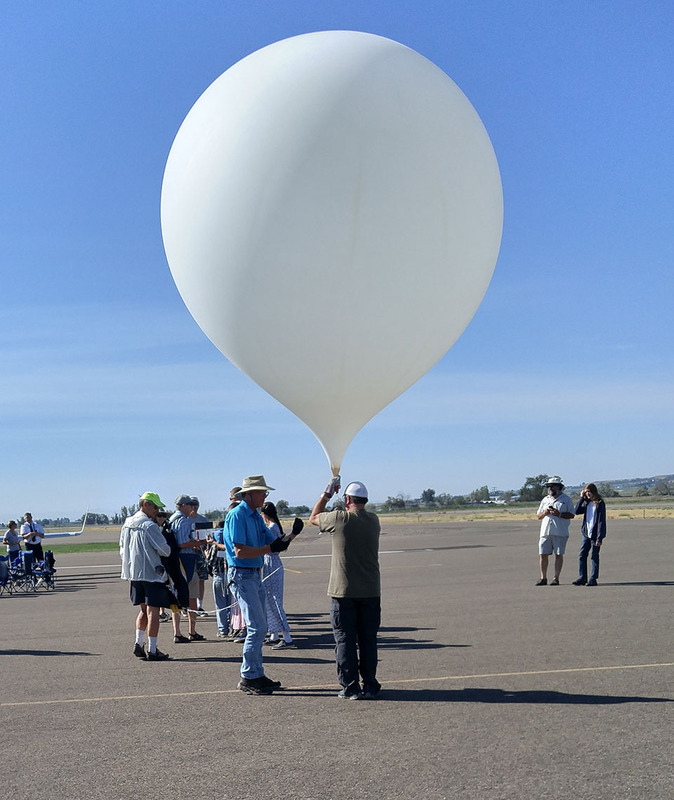 My balloon also carried a photometer that was pointing straight up. A photometer is a device for measuring the intensity of light. In some cases, as in my balloon flight, a photometer can measure the intensity for specific colors. The data shows that as the moon covered up and blocked the sun, the sky’s brightness decreased identically for all nine colors I measured. So from ultraviolet to infrared, all colors were affected the same. 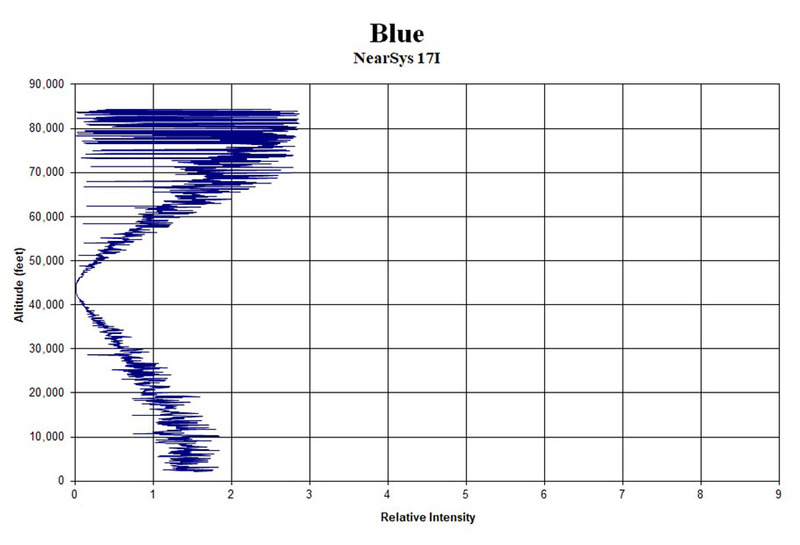 One of nine photometer charts I created from my data. All colors showed the same pattern of intensity. The photometer spins and rocks during the balloon’s ascent. Therefore, the intensity measured in each color of the spectrum shows the same jaggedness. But the jaggedness becomes less extreme and the average intensity approaches zero as the eclipse reached totality when the balloon was at 45,000 feet. In addition to cameras and photometers, my balloon also carried a Geiger counter and thermometer. Surprisingly, the blockage of the sun, which is a source of cosmic rays and the atmosphere’s heat, had no apparent effect on the atmosphere’s cosmic ray intensity or the air temperature. 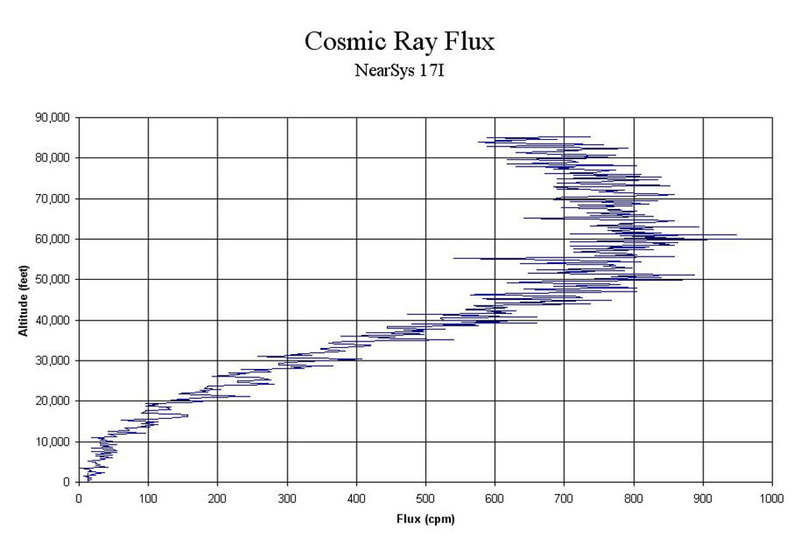 This may look significant, but it’s actually pretty typical of the cosmic ray flux as a function of altitude. I was hoping for a noticeable drop in cosmic ray flux around 45,000 feet, but only got a tiny blip. That blip disappears when I look at the rate at which the flux rate is changing with altitude. Therefore, I expect it’s nothing more than an example of the random nature of cosmic radiation. 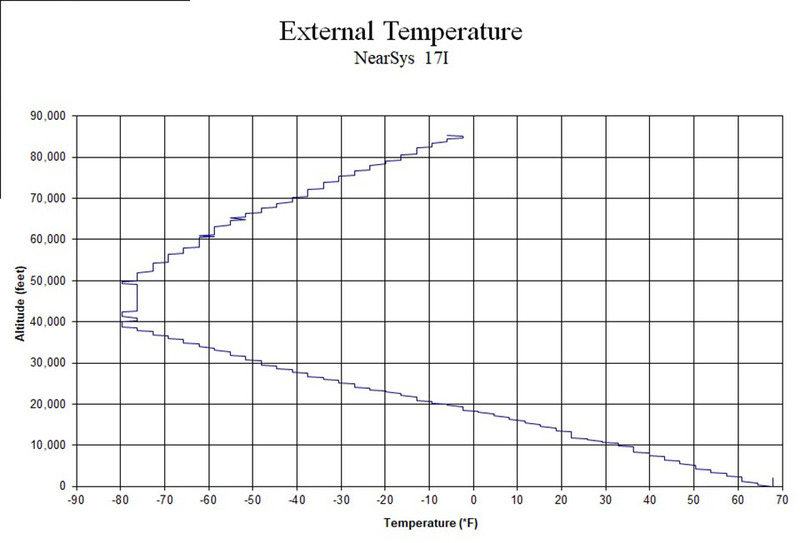 This is also a typical temperature pattern observed during a balloon’s ascent into near space. The air temperature of the troposphere (the lowest layer of the atmosphere) decreases as the balloon climbs upward, or away from its source of heat. 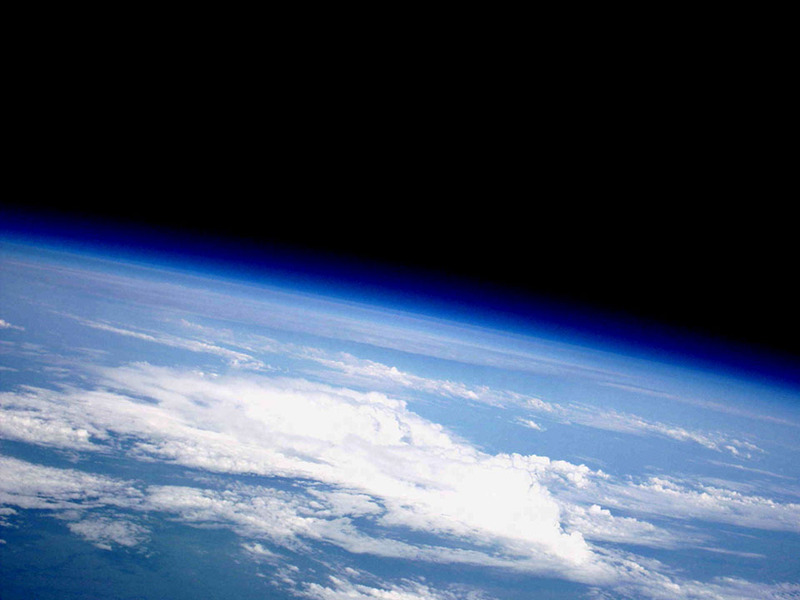 Once the balloon enters the stratosphere (at around 50,000 feet) however, the air temperature increases due to the presence of ozone and solar ultraviolet radiation. The constant temperature observed between 40,000 and 50,000 feet appears in many flights and marks the boundary between the troposphere and stratosphere, which is called the tropopause. 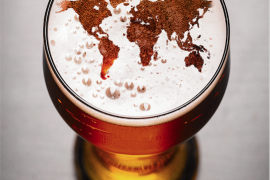 What’s Next for This Idahoan? 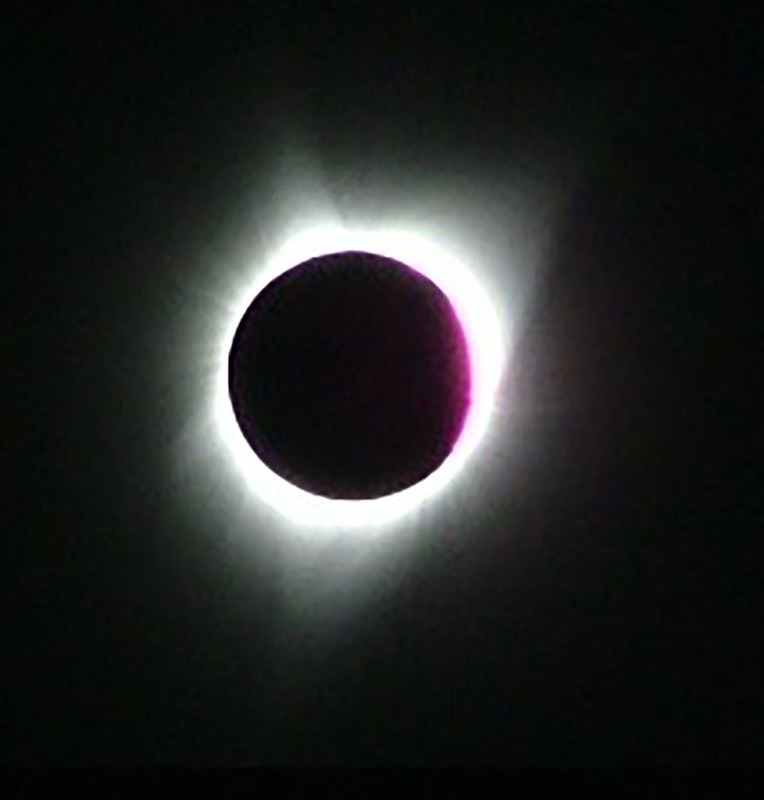 The next total solar eclipse to cross the United States occurs in April 2024. This time the moon’s shadow will span a larger diameter on the ground, making the eclipse last longer. Unfortunately, this is not a local eclipse; I’ll have to travel to Texas to see it. There’s a high altitude ballooning community out there and I’ll be able to get help form them. So I’m planning to launch several balloons in the hopes of getting even higher altitude data. I’m also planning to carry duplicate experiments, like Geiger counters, so I can compare results to bring out small changes in environmental conditions with more certainty. And who knows what new technology will become available in seven years? I may be flying experiments I can’t even imagine today.